Fuggled: Hail to the König! There are times when I peruse the beer aisles in the various supermarkets and bottle shops I frequent that I wonder how some prices for 6 packs are justifiable. Most locally brewed beers are north of $10 a six pack when you include sales tax. it is one of the reasons I am an unashamed fan of Trader Joe's and their contract brewing program that puts well made beer on the shelf for about 30% less than name brands. 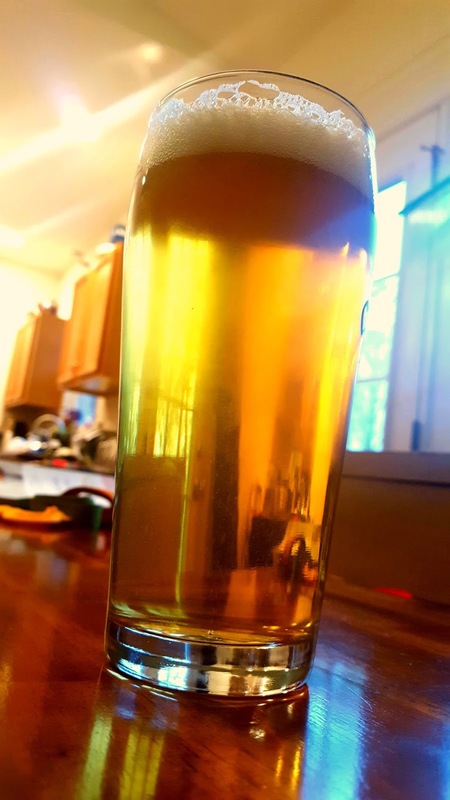 I am sorry all you awesome craft brewers out there, most of your products are simply not worth the money when Traders has something I can rely on for far less, add to that list König Pilsener. Brewed in Duisburg-Beeck in Nordrhein-Westfalen (the part of Germany that one collection of my ancestors came to the UK from), the König brewery is a wholly owned subsidiary of Bitburger, a family owned brewing group that according to their website produces a little over 6 million barrels of beer a year. König themselves make about 950,000 of those barrels, and thus the entire Bitburger group would qualify as craft beer according to the Brewers Association's eminently maleable definition. 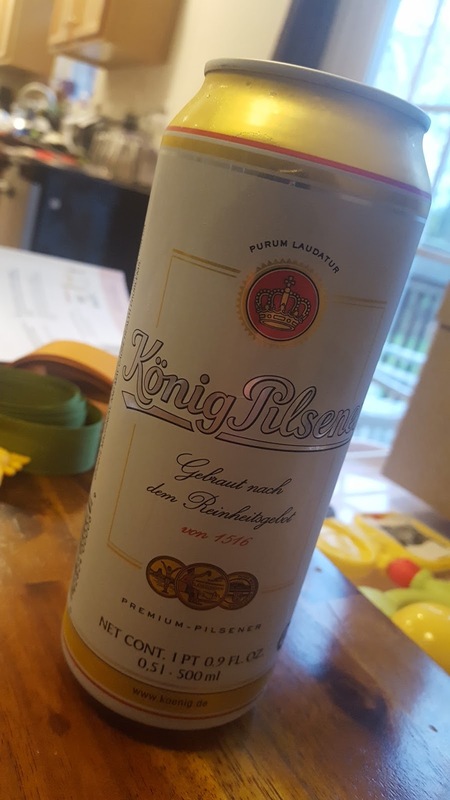 König Pilsener retails at my local Wegman's for about $7 for four half litre cans and really it would be remiss of me not to buy a four pack and see if it is only 70% as good as the more expensive local beer that hasn't crossed an ocean to get here. Enough with the snidery about meaningless definitions of who gets to be in the gang and who doesn't, what about the liquid in the can....the classy can that tells us in suitably curly fonts that the beer is brewed to the strictures of the defunct Reinheitsgebot. Well it pours a rather fetching straw colour, it is a pilsner after all, topped off with a healthy 2.5 centimetres of bright white foam that gently recedes to leave a 1cm cap that just kind of sits there for the duration, streaking itself down the glass. Breaking their way through the lovely head of foam were aromas that are just classic pilsner; that crackery malt character, floral hops, touches of hay in the background, and even the occasional wisp of honey. 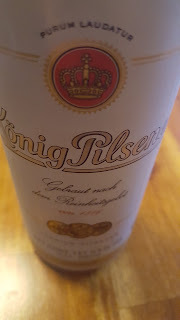 In the drinking again we are in solid German pilsner territory, water biscuits, that light honey sweetness floating around, and a lemony citric bite from the hops that cuts the malt leaving the mouth refreshed and ready for more...more...more. In lots of ways König Pilsener reminded me of probably my favourite American made pilsner, Sierra Nevada Nooner. 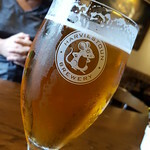 It is sufficiently complex so as not to be dull, but deeply uncomplicated, the kind of beer that demands at least a half litre rather than a mere 12oz. The kind of beer that conjures images of spring time in beer gardens, scoffing bratwurst with mustard, and hanging out with good friends as the sunlight dapples through the leaves. As it is, my back porch will have to suffice, but thankfully good friends are available, as are bratwurst similar to the ones I grew up on in Germany, and good quality senf from Düsseldorf. At $7 for 2 litres the beer will be König Pilsener. Guess I'm headed to Trader Joe's! I drank Koing Pilsener when I was stationed in Germany, loved it. I actually get these at Wegman's, sorry if that wasn't clear from the post.